Agudath Israel of America, an umbrella organization for haredi Orthodox Jewry in the US, released the following statement in light of Israeli President Reuven Rivlin's address at the Jewish Federations of North America's (JFNA) General Assembly in Los Angeles. "In advance of Israeli President Reuven Rivlin’s address to the Jewish Federations of North America’s General Assembly, that group passed a resolution on “Jewish pluralism” in Israel, opposing a bill to enshrine a single conversion standard in the country and asserting that the Israeli Government’s decision to freeze an agreement about the Western Wall has “deep potential to divide the Jewish people. "It is sadly ironic, although not surprising, that leaders of heterodox movements that have in fact undermined true Jewish unity and continuity by inviting intermarriage and breaking away from the Jewish religious heritage have of late been lecturing others about Jewish unity. "More disappointing still are the unity-cries of the Jewish Federation movement. The historic role of Jewish federations has been to provide support and solace for disadvantaged or endangered Jews and to mobilize the community to come to Israel’s aid when it is threatened. Taking sides in religious controversies anywhere, and certainly in Israel, egregiously breaches the boundaries of that role. "The Jewish Federations of North America, moreover, has traditionally sought to represent all of American Jewry, but here it entirely ignores the feelings of the substantial and growing American Orthodox community. "The Reform and Conservative movements, despite their great efforts over decades, have few adherents in Israel. Most of their members do not visit or settle in Israel, nor do they visit the Western Wall in large numbers. And yet their leaders seem prepared to offend the religious sensibilities of their Orthodox brethren, who regularly visit and move to Israel, and who come to the Kotel to pour out their hearts to G-d there. A holy place should not be balkanized, nor wielded as a tool to advance partisan social goals. "And the patchwork of standards for conversion that exist in America has created an Ameican Jewish landscape where those who respect halacha as the ultimate arbiter of personal status cannot know who is in fact Jewish. Creating in Israel a multiplicity of “Jewish peoples,” as is the tragic reality in America, would not foster unity but its opposite. 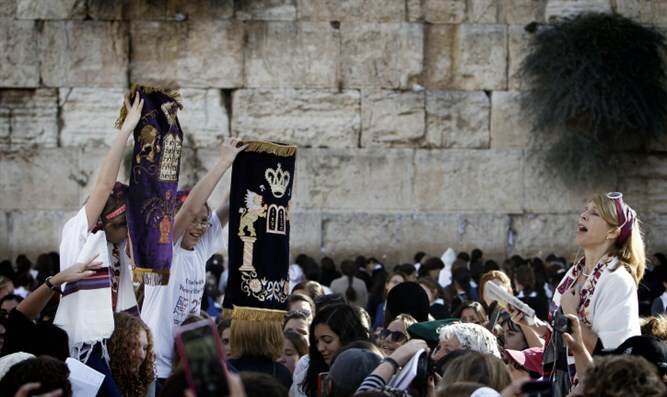 "To our dear Jewish brothers and sisters, we say: Please do not push for changes at the Kotel that will only cause discord and pain to the vast majority of Jews who worship there. And please realize that the conversion standards that have ensured Jewish unity for millennia are the only ones that can preserve it for the future."